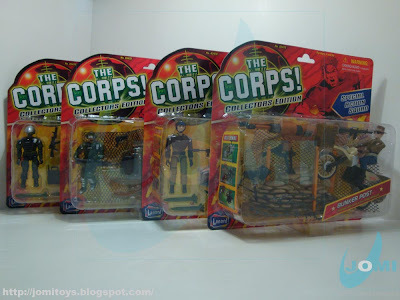 Going back to 2001, these "collectors edition" sets brought some (yet again) new repaints of previous Lanard´s action figures. The weapons vary from old "THE CORPS!" molds to "new" ones. Curisously, most are partial "trace" copies of G.I.Joe weapons, if not complete blueprint tracing. Same "old technique" of grabbing some figures and small vehicles together and give it a fresh paint and a fresh package. Still works, though. Most (if not all) accessories go along with the rest of the 3 3/4" figure lines, so "THE CORPS!" pretty much keeps their saga alive. Bunker Post with figure, "Jones". This guy´s been around since the late 80s. A winner. The dirt bike has always been far superior than Chap Mei´s. Scale´s the key. 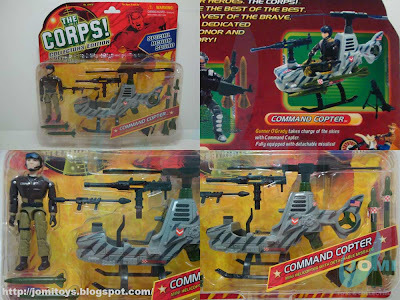 Command Copter with figure, "Gunner O´Grady". Another vet, comes with another Cobra FANG bootleg. A good one. But here, CM gets the prize for the best knock-off. This tail is just too small to fly right. Not to mention the rotor blades. If you haven´t yet noticed, the missiles are copies of the dragonfly´s (or MCC) and of Cobra Trubble Bubble´s. 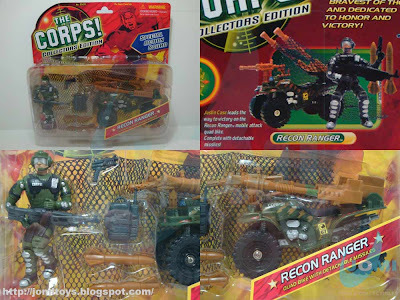 Recon Ranger with figure, " Justin Case". 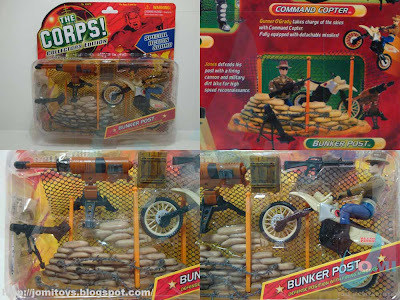 One of the 1999 additions to the "THE CORPS!" ranks. The quad is a cool vehicle. The weapons are too big, but an overall respectable ATV. 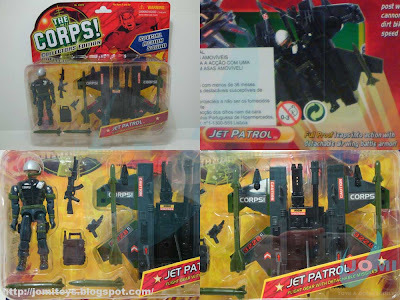 Jet Patrol with figure, "Full Proof". Another late 90´s additional figure to the former collection of 30 seasoned troops. The Jet Pack also carries G.I.Joe-molded missiles. The vehicle itself is a repaint of the STAR Force "Jet Ranger".